METTLER TOLEDO's comprehensive range of laboratory balances and analytical instruments provides users with flexibility and precision in every laboratory application plus outstanding quality and functionality. 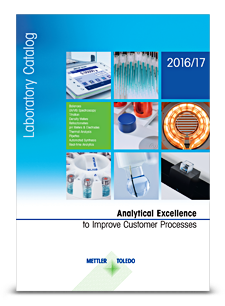 METTLER TOLEDO offers a broad portfolio of high performance laboratory balances and analytical instruments for many laboratory applications. Our instrument portfolio was developed to meet the special needs of reasearch and development laboratories. Getting reliable results efficiently is key for most quality control laboratories. Our laboratory balances and analytical instrument not only focus on providing precise results but also make operation easier and support compliance with SOPs and regulations.